Cauliflower is so in right now. From pizza bases and buffalo wings to fried rice and nuggets, the humble cauliflower has been reinvented and is currently the trendiest vegetable around (move over kale). I’d like to point out I’ve been a fan from a young age (no bandwagon jumping here). 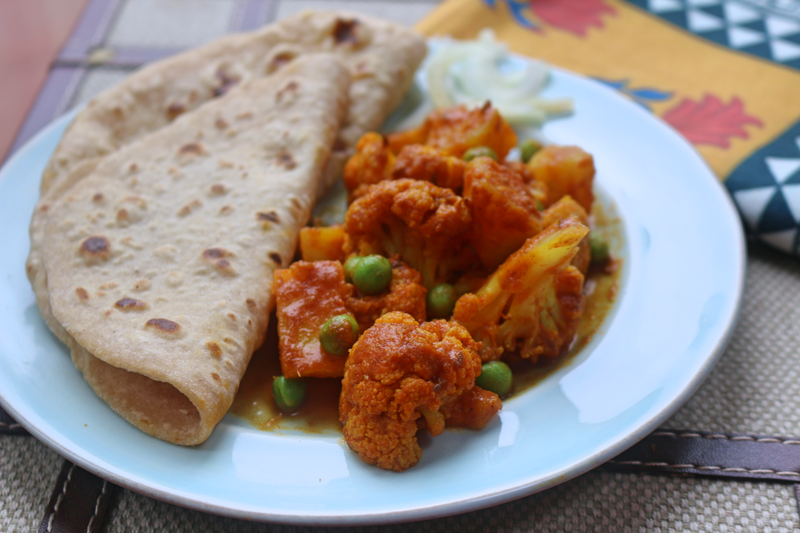 Cauliflower or gobi has been a regular part of my diet and in Indian cookery it’s used to make everything from curries and pakoras to pickles and paratha stuffings. 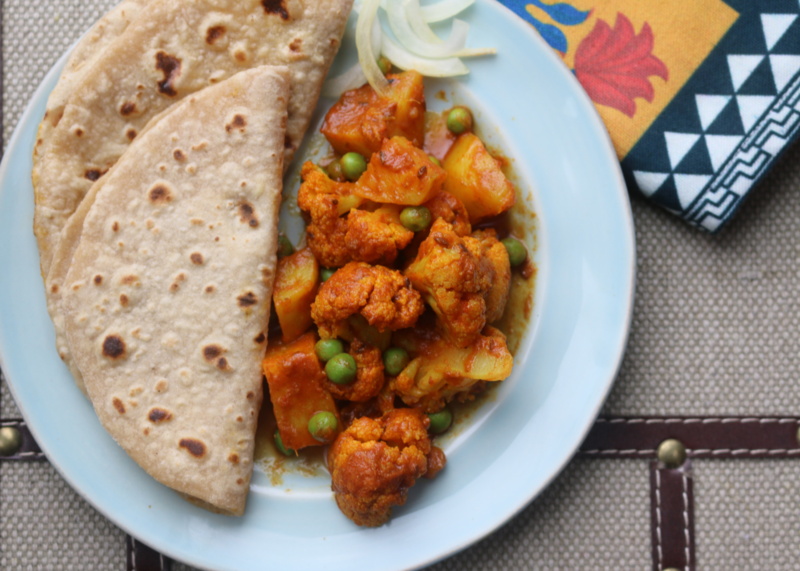 Gobi Aloo is a quintessential Punjabi dish and ticks all of the boxes. With a super simple preparation and a limited number of spices, it’s unbelievably satisfying and really nutritious (without tasting like it!). Served up with some hot chapatis it’s a winner every time. Give it a go-bi! Sorry couldn’t resist…I’ll stop typing now. Heat oil in a pan. Once hot add the asafoetida and cumin seeds. When they begin to splatter, add the ginger and cook for 3-4 minutes until light golden. Now add the pasata and chilli and cook for a further minute. Add the potatoes, mix and place a lid on the pan. Cook on a low/medium heat setting for approx 5 minutes. Now, add the cauliflower florets along with peas, salt, paprika and turmeric. Mix together and once again place lid on the pan. Cook on a low heat setting for 15-20 minutes, stirring occasionally. (Keep an eye on the pan -if the vegetables are catching, you can add a little more oil or a splash of water). The vegetables should be completely tender once cooked. Now add the garam masala, amchur and fresh coriander and place a lid on the pan again. Allow the flavour of the spices and fresh coriander to infuse for 10 minutes and then mix before serving. Check for salt and adjust accordingly. Finish with fresh coriander.